We provide services in Masschusetts and Rhode Island only. We like to focus on our local community and serve our neighbors with personalized and friendly service. Finally, why buy from Mod-Tech Homes? We’re glad you asked. Our homes are designed, engineered, and assembled in a controlled environment in modern factories. We combine modern assembly line techniques with old-world pride and craftsmanship to produce the finest homes available. We are also the ONLY turnkey provider of modular homes in our service area. This means we handle your entire project: from permit through certificate of occupancy. We also take care of difficult permit situations, including conservation commissions and zoning variances. Are there style limitations to modular homes? The only limitations in modular homes are the same issues that exist in traditionally built homes. Those include building permit issues like setbacks and zoning restrictions or any other code-related issue that may need to be managed. Mod-Tech Homes handles this for the homeowner if they wish. Structural issues will also limit modular or conventional homes. The highest value in modular homes is achieved when our factory does most of the work. Who is the typical modular home customer? Today’s customers come from all walks of life and all income levels, from older couples retiring to the Cape, to young families replacing older family homes for more space, or even those buying a teardown for investment. Mod-Tech Homes has seen a significant increase in the construction of new homes for single woman. Mod-Tech Homes has also found that while many homeowners love their current neighborhoods or towns, they may need such extensive upgrades to their older homes or cottages that remodeling is cost-prohibitive. Many homeowners choose to demolish their old home and rebuild with a modular home. Demolition of existing housing stock, particularly in waterfront communities has become very popular, primarily because modular building provides the homeowner with a speedier move-in process, disrupting families for a shorter time during construction. Banks and lending institutions make no distinction between modular homes and site built homes. Modular homes are approved under conventional mortgages, FHA loans, MSHA loans and more. In fact, some banks realize that there is less risk inherent with modular homes and offer special programs that can save you additional money. We have several resources to assist you in the financing process. Banks that do modular lending love it because their risks are low and the projects are quick. When you add the labor, material, and time savings inherent in the modular building process, you will find the price of a modular home to be 15-25% lower than a traditionally built home of similar quality. 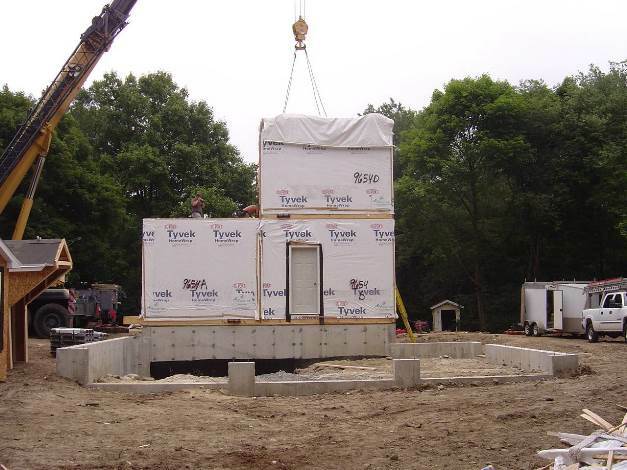 More importantly, you will continue to save money year after year, because modular homes are built extra tough so they can withstand shipping and craning onto the site foundation. This translates into lower maintenance and heating costs. Should you ever sell your modular home, you will realize the same resale values as other traditionally built homes in your neighborhood. Speed and consistent quality are two of the many advantages for choosing a modular home. The factories range from 3 to 5 working days to produce a house in their facilities. While Mod-Tech Homes prepares the foundation at your site, the factory’s craftsmen construct the modular sections of your home. By producing your home indoors, building materials are kept out of wind, rain, and snow as well as protected from vandalism and theft (common job site dilemmas). Most framing, drywall, electrical and plumbing components, bath fixtures, countertops, cabinetry, and the flooring are installed at the factory, which means you don’t have to hire more people to install different components in your home. This greatly enhances affordability and saves valuable move-in time. After the home is delivered to your site, it can take anywhere from 4 to 8 weeks (depending on style and complexity) for Mod-Tech Homes to complete the finish work. 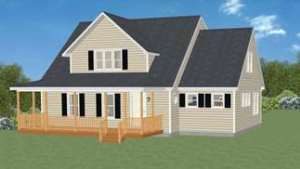 Is there a limited range of modular home styles to select from? Absolutely not. Mod-Tech Homes’ designers customize all our homes and additions with our clients. There has never been a design concept we could not produce. The days of “fixed” designs are long gone. Mod-Tech’s in-house CAD (computer aided design) department uses Chief Architect, a cutting-edge design program that allows the customer to design the home in a virtual reality world. There, you can see the actual kitchen cabinets in 3D or experiment with options such as dormers, reverse gables, and farmer’s porches. How does the quality and detail of a modular home compare with the construction of a stick-built house? Because Mod-Tech’s modular homes are factory built; the quality of modular housing is superior to conventional building. The obvious lack of exposure to the elements for the building products assures quality control, and they must pass rigorous inspections prior to shipping. All inspections take place at the factory, where the buildings are “glued and screwed” to withstand road travel, and have higher insulation factors. All of these factors allow Mod-Tech Homes to offer a 10-year warranty in addition to factory warranties, also 10 years. Mod-Tech’s modular homes meet or exceed all applicable national and local building codes, while the bulk purchasing power of the factories results in higher quality finishes at a substantial cost savings. Why would someone choose to build a modular home as opposed to a stick-built or traditionally constructed home? Quality of Construction – Modular homes are constructed in factories, which are controlled environments, preventing the materials and the craftsmen from being exposed to harsh weather conditions. Length of Construction Process: typically, modular homes are constructed in a 4-8 week cycle from foundation ready. Value: There are tremendous savings due to factory efficiencies, speed, weather impacts, and more. What are the advantages to building a modular home? The modular process is the same as traditional home building until the feasibility of permitting is established. Then, the modular process moves more quickly because the house is fully specified when ordered. After the options are selected and coordination is completed with the factory, installation starts and Mod-Tech completes the home. Another advantage to building modular homes is in the costing: once the homeowner makes selections, they are locked-in at the factory. This protects against “price creep” as changes in specifications during construction (known as “change orders”) are traditionally the most unpredictable variable. Also, we order your home at a set price and that is the price that is paid. There is less uncertainty for you and your bank. A modular home is a custom designed factory-built home assembled and finished on site. Assembly line production is incorporated into the building process to construct homes that are stronger, of higher quality, and more cost-effective than traditional construction. The homes are then shipped via flat bed trucks to a site, prepared by Mod-Tech Homes with foundation and utility hook-ups in place. Mod-Tech’s team of experts then completes what is commonly called the “B,” or “button-up” work which usually takes 4-8 weeks from the beginning of the construction to the time the homeowner moves in. This significantly condenses the building process timeline over conventional construction and virtually eliminates weather-related delays, while simultaneously reducing the risk of mold and mildew problems and increasing energy efficiency. All of our homes can receive an energy star rating for the entire home for a small additional charge, a feature that is difficult and expensive with traditional construction. Here is more information to help you understand modular homes. Schedule a free design clinic meeting. Looking for current specials or promotions on your Mod-Tech home.